Studied painting under Professor Sid White, Susan Brenner, Jill Kiefer and Sculpture under Ludwig Seibert. I paint Cityscapes and Narrative Paintings along with 3D box sculptures. 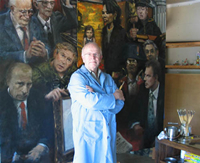 My subject matter comes from both USA and Former East Germany where I spent part of my life. 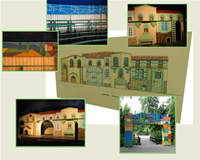 I also do Commercial Design for Theater stage scenes and themed work for Theme parks.